If you have someone in your life who loves canal boats and narrowboating, let us take the stress out of this year’s Christmas shopping by offering you five unique and unusual stocking fillers for your boating friends and family. Grab one of these for the canal boater in your life today, and save yourself some time during this busy holiday season. The Imray guides are popular paperbacks for river users planning trips along the Rivers Nene, Ouse, Cam and the Middle Levels. These spiral bound books offer commentary and essential notes with detailed mapping of each section of river. If you dream of narrowboat holidays it’s fun to peruse the routes and imagine which one you might take next summer. They are available on Amazon or in our chandlery at our marina in March, Cambridgeshire. For history enthusiasts and owners of Fox narrowboats, this unique 60 page soft book tells the life story of Charlie Fox and was compiled by his granddaughter Emily. Fox narrowboats are known for their distinctive bow shape and each of Charlie’s boats had their number welded into the steel of the front. The book tells the story of Charlie from young child, to that of the man who built narrowboats and went on to create the Fox Narrowboats Marina at March. Read more. 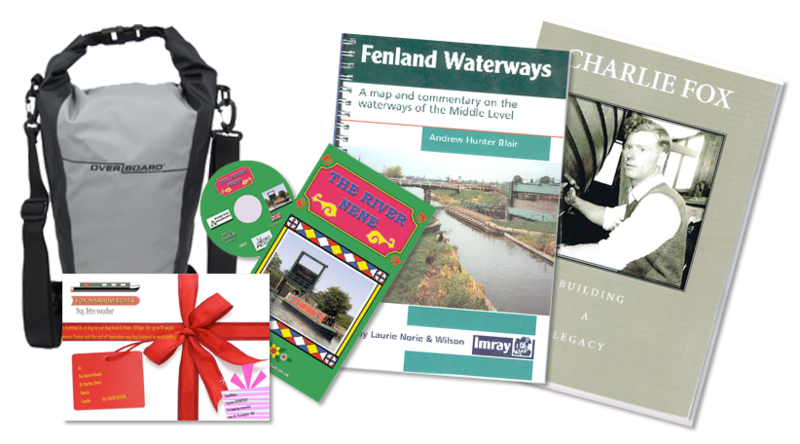 For those wanting to enjoy the beauty of our Fenland waterways from the comfort of their own home this collection of DVD guides is ideal. 500 years ago Fenland Britain was a series of vast freshwater lakes, or “fens” with a few sporadic islands sticking up above the water. Today the drained fens are the richest farmland in Britain, and the drainage channels can be navigated and link the River Nene at Peterborough to the River Great Ouse at Denver. The Middle Level DVD explores not just the recommended route across, but the many backwaters as well. It is available separately but could also be bought as part of a set of three that includes the rivers Nene, Great Ouse and River Cam. Read more. What a great idea for someone who loves spending time on or near the water! Get your gadgets protected with this collection of covers for cameras, mobile phones and tablets from Overboard. If you’d like to treat the whole family to an unexpected outing, the day hire vouchers for a trip on March Adventurer are for up to 10 people. Tuition, lifejackets and fuel are all included. Our marina in Cambridgeshire is surrounded by some beautiful waterways. With lots of room at the front and rear of the boat everyone can be outside while cruising the rivers and taking in the picturesque scenery and wildlife. Our day hire narrowboat has a galley complete with hob, fridge and sink, a dinette equipped with crockery and cutlery, a toilet and a seating area. Read more. We hope these ideas solve some of your gift buying dilemmas, and we wish you a very happy Christmas and New Year from everyone at Fox Narrowboats.